It’s a holiday weekend here in London. Spring is in the air. The sun is shining, the birds are singing, the city is full of flowers, and my husband just offered to take me out to dinner. Nothing but good times ahead 😉 . I was planning a Good Book Squee, but that will have to wait until next week. All of a sudden, my head is full of lobster cocktail, shrimp tempura, steak, cheesecake, great conversations and lots of laughter. I’m smiling just thinking about it. We’ve been going regularly to Goodman Mayfair since it opened in 2008. It’s been my favorite restaurant for almost nine years now and I don’t expect that to change any time soon. Every time I go, I’m blown away by the excellence of their offering, and I always think about what it takes to keep their customers coming back for more, year after year. A superb steakhouse has a lot in common with an outstanding piece of genre fiction. 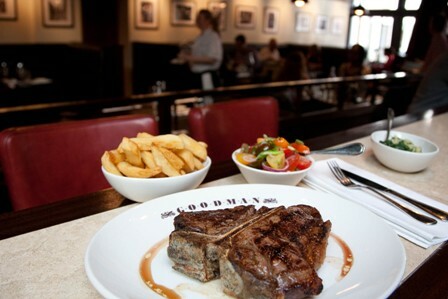 Goodman is never likely to win an industry award for the best restaurant in London, because steak and fries don’t have the requisite culinary snob value, but it has built up a loyal and smart clientele who repeatedly choose to spend their time and cash there. When you visit Goodman’s website, the first thing you see is their customer promise: Great Steak. Great Wine. Great People. That’s Everything Covered. Their invitation couldn’t be clearer. If you’re in the mood for a steak, you’ve come to the right place and you can trust us to make sure you’ll have a great time. If you’re looking for sushi, or Michelin-starred dining, you won’t find it here. If you want to make a business out of something as familiar as steak and chips, you’d better have an outstanding product. The folks at Goodman are obsessive. They visit every producer they buy from – in places like Nebraska, Ireland, the Lake District, and Devon, dry-age and cut them on the premises, and never, ever compromise on quality. Goodman’s salads are fantastic. So are their vegetables. And their bread. The ice cream is out of this world. All those peripherals are there to support the core offering of steak and fries, but loving care and attention is lavished on each of them. Reputation is everything. No matter how many times you deliver the goods perfectly, the off day is the one everyone will remember. Don’t ever settle for less than your best. Quality comes at a price. If you offer an excellent product, you don’t have to sell yourself cheap. Look after your staff, your suppliers, all the people you depend on to deliver a great end result. Get to know your customers and cherish them; they’ll be your best advocates, and they’ll keep a smile on your accountant’s face. We return to Goodman again and again, because it’s such a pleasurable experience. I’m not sure how much of their business comes from repeat customers, but I’ll bet it’s more than half – maybe much higher. Do you have a favorite restaurant, or shop, or service provider? What makes them special? This entry was posted in Basic writing skills, Everything Else, Inspiration and tagged eight ladies writing, Goodman Mayfair, inspiration, Jilly Wood, Nothing But Good Times Ahead. Bookmark the permalink. Mmmmmm! Steak! Well, that blows my concentration! LOL. I grew up in Nebraska, and yes, good steak. It was a treat for my family, but some ranchers had steak and eggs for breakfast every morning, or at least that’s the rumor (urban legend? rural legend?). Then you know exactly what I’m talking about, Michaeline 😉 . Sorry to offer further distraction, but we shared a huge Nebraska corn-fed porterhouse steak and truffle fries, and I have to say it was utterly delicious. Can’t imagine doing that for breakfast every day, but I guess it’s good fuel if you’re out on the ranch being energetic for the rest of the day. (-: They probably had smaller steaks for breakfast. But then again, remembering the bellies on some of those good ol’ boys, maybe not! That steak is making me hungry as I look at it. Hmmm….dinner….